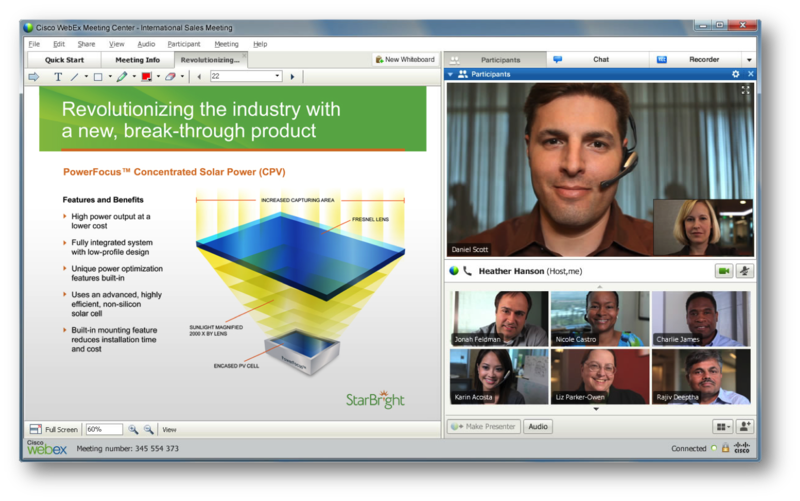 WebEx is the most-frequently used web collaboration tool on the market today. In addition to providing standard web-conferencing features such as screen sharing, audio/video conferencing, file sharing, and IM chat, it provides the ability to include a room-based video conferencing endpoint into the session. The system allows for up to 1,000 people to meet simultaneously. OSU has purchased a site license, effectively giving all staff/faculty their own account to host conferences, as well as 33,000 student licenses (truncated version of staff account – only can connect 8 people when hosted by a student account). A license is only needed to host a session, therefore non-OSU people can join an OSU WebEx session without requiring their own license. We also have the ability to bring in standards-based video conferencing (i.e. Polycom or Cisco room-based video system) endpoints into the WebEx session. This will require additional technical assistance (via that department’s DCA or tech lead) to set up and schedule. A collection of helpful WebEx documents created and maintained by the OSU ServiceDesk. Choose a room: Reserve the appropriate room for your session. If you want to use a Media Services videoconference room, your reservation request must be approved before you can proceed with conference setup. Identify participants: determine the number of sites and the number of participants at each site. Confirm that each site has access to the necessary A/V equipment.